In moments of crisis, people often show great courage. A man helps a woman in floodwaters from Tropical Storm Harvey Sunday, Aug. 27, 2017, in Houston, Texas. The remnants of Hurricane Harvey sent devastating floods pouring into Houston Sunday as rising water chased thousands of people to rooftops or higher ground. More than 9 trillion gallons of water have been dumped on the city of Houston already, endangering thousands of people and straining the city’s emergency response system so much that people are turning to Twitter to call for help. But as Houston gets flooded with up to 50 inches of rainfall, turning highways into rivers and homes into pools, stories of heroism are coming from all over, showing that in moments of crisis, people can act with great courage and generosity. 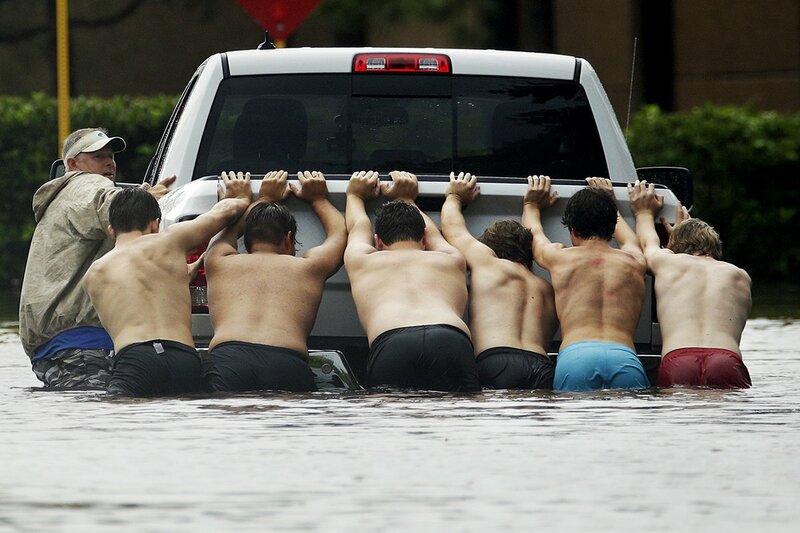 People push a stalled pickup through a flooded street in Houston, after Tropical Storm Harvey dumped heavy rains, Sunday, Aug. 27, 2017. A man helps children across a flooded street as they evacuate their home after the area was inundated with flooding from Hurricane Harvey on August 27 in Houston, Texas. Andrew White (L) helps a neighbor down a street after rescuing her from her home in his boat in the upscale River Oaks neighborhood after it was inundated with flooding from Hurricane Harvey on August 27 in Houston, Texas. Brad Matheney offers help to a man in a wheelchair in a flooded street while Hurricane Henry passes through Texas August 26 in Galveston, Texas. Donna Raney makes her way out of the wreckage of her home as Daisy Graham tells her she will help her out of the window after Hurricane Harvey destroyed the apartment on August 26 in Rockport, Texas. Volunteers and officers from the neiborhood security patrol help to rescue residents in the upscale River Oaks neighborhood after it was inundated with flooding from Hurricane Harvey on August 27 in Houston, Texas.